Have you ever overheard a conversation about a woman’s age? Have you seen the dynamic that takes place as a group of women discuss this topic? Imagine a group of woman who are sharing age-related details. The youngest (under 30) clearly state their age. They might assume that the 30 something women in their presence are close in age. Some might express surprise that a woman is over 30 or 35. This is usually taken as a compliment. Isn’t it better to be viewed as looking or being younger than you are? Or is it? Others reveal, discreetly, that they are older. As you head into the 40 and 50 year old group, the “age reveals” are delivered more quietly. Of course not all women are like this. Some are like Ellen DeGeneres, in the video below, and boldly state their age. 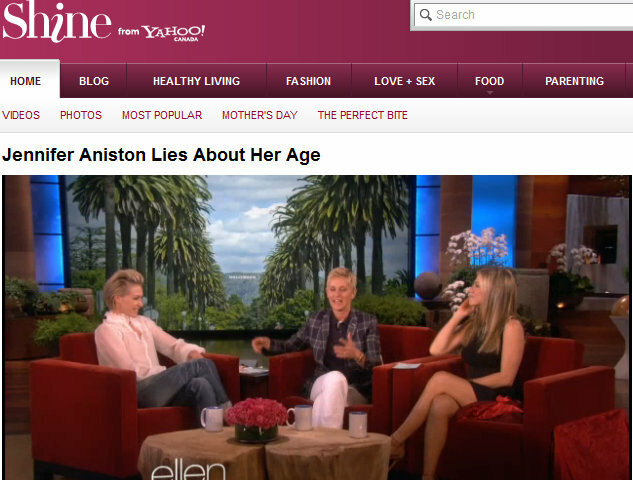 In a conversation on the Ellen show, filmed in January 2013, Ellen DeGeneres, Portia de Rossi and Jennifer Aniston question the practice of printing an actor’s age next to their name – even though it is rarely a relevant piece of information. Doesn’t it seem that this happens even more frequently if the actor is a woman? Is this obsession with age a Hollywood issue? Isn’t Hollywood the place where you can expect the best roles to dry up as you pass 40? Jennifer Aniston revealed that she was more anxious about turning 30. Many people share her viewpoint and declare boldly that 40 is when life begins. Yet many women also retreat into the shadows and don’t want to talk about their age when they are close to 45 and beyond. There are many unspoken issues surrounding women and aging. Some women have children when they are under 25, some when they are over 40 and some never have children (biological or adopted). How does becoming a parent affect your sense of yourself and your age? How does parenthood affect related issues such as perception of beauty and youthfulness? How does becoming a grandmother before 45 or 50 alter your perspective and how other people see you? What are the benefits of passing major milestones such as turning 40? Are there benefits to being mid stream Generation X employees who are becoming the older staff members? Do some societies have better attitudes towards aging than others? It seems that we don’t have conversations about aging very much – especially amongst women. Or if we do, it’s often to crack a joke about getting older. What message does this give youth? When you are a teenager you cannot imagine being 35 or older. Life marches by quickly and before you know it you are facing the big 25 or 3-0. How can we become more comfortable about, and appreciate, aging? This is definitely a topic that we need to talk about….more. Beautiful celebrities in their forties.